I found myself a bit surprised how much I was looking forward to covering this record. 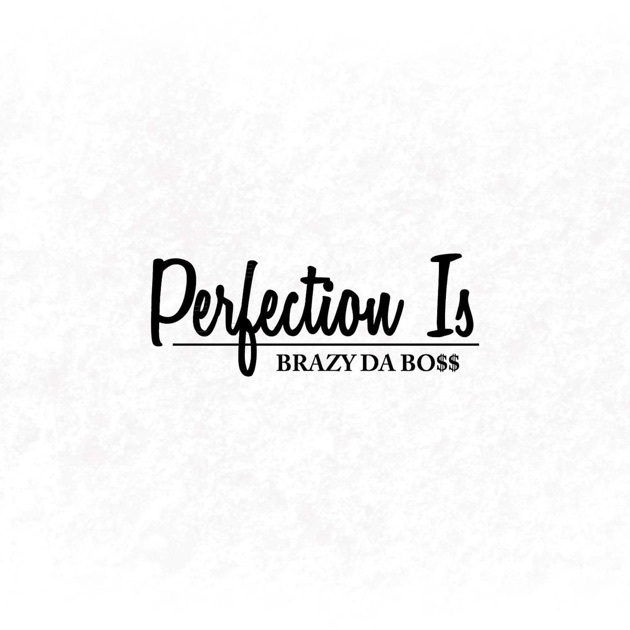 And I say that because I've been watching Brazy Da Bo$$'s artistic evolution for a couple years now, from 2015 where I covered two of his projects to 2017 with an album that looked to be more experimental than ever before. For those of you who don't know, he's a Baltimore rapper that has a fine enough ear for beats but occasionally could struggle technically with content and delivery, although not to the point where I was going to outright ignore a project. What caught more of my attention was that in the era of mixtape culture he had taken his time to refine a new full-length record and from lead-off singles looked to have pushed both his flow and production into very different territory than the spacier bangers that he used to favour. Granted, I wasn't exactly crazy about his singing voice which he looked to be employing a little more, but again, I approve of experimentation and I wanted to see what he could pull together. So what did I find on Perfection Is? Well, to put things frankly, of the three projects that I've covered from Brazy Da Bo$$ thus far, this is easily his strongest effort to date. I'd hesitate to call it a great rap record, but it's certainly solid, reflective of an artist who has shown steady improvement over the past few years and who I continue to cover because I'm convinced he's got real potential. And at this point, if he managed to polish up a few loose ends, I'd easily slot him among a list of reliable underground MCs that might not be tremendously experimental but through a combination of good skills and great production builds the sort of trend-defying cult following that you find for an act like Styles P or Fashawn. And not to oversell this, but a huge part of why I believe this is production. I've always said Brazy Da Bo$$ has a great ear for beats and this time around he got his most diverse and colourful set to date, content to pull from modern trap trends but also dip into oldschool soul and more colourful synthesizer, strings, guitar, and horn tones. Yeah, the horn tone might seem a tad thin on lead-off single 'Life' - and I said earlier, I wasn't a fan of his sung hook - but he plays off the sandy cracks, sizzling guitars and watery organ tones remarkably well, and when you follow it with songs that vary from the shimmering gloss and chimes of 'The Game', the dirty and heavy scratches of 'Let Me Out' courtesy of DJ Rocky Styles, the bombastic orchestral swell on 'Unlimited Rhyme', and the haunted keys and trap skitter of 'Double Jointed', it's clear you're dealing with an artist who is not going to need to stick with one solitary sound, and that does wonders for keeping the album moving. Hell, right from the opening track there's a production change-up that might feel a tad stiff but is improved immeasurably for the deep-cut 'Dream', which takes a gorgeous orchestral sample for the first half off the hi-hat that's later takes its gloss into eerie, more subtly twisted territory. Now I'm not crazy about all of the production choices - the thick oily synth piled onto the chorus of 'Death' spoils an otherwise atmospheric tune, and 'Material Things' could have easily used another verse to really flesh out a song that's a borderline interlude, and yes, if you're looking for production with more grit some of the production here might seem a tad too clean, but there's a lot of melodic depth and tone to these mixes, and the hooks definitely stick with you. Granted, I think part of this is reinforced by Brazy Da Bo$$ rapping instead of singing over these hooks - 'Life' thankfully is an outlier - and that takes us to his rapping itself. Now let's establish this right out of the gate: this record is explicitly intended as a bars fest, primarily focused on showcasing our rapper with sharp punchlines that aren't really intending to get tremendously deep or conscious. Now this can be something of a mixed blessing: you're not getting anything as personal as 'All Dogs Go To Heaven' or as directly political as 'City On Fire (Pray For Baltimore)', and both of those tracks captured something that Brazy Da Bo$$ made his own with a real personal touch that I appreciate and revisit to this day. But at the same time, when just tasked to deliver interweaving punchlines and bars, he sounds more comfortable in this lane and more consistently than ever he delivers. Again, it's not like he doesn't reference socio-political issues - police brutality and systemic racism comes up early and you can tell it colors his experiences - or that he doesn't get conceptual, with 'Dream' focusing on potentially encountering that perfect woman and then nearly cheating on her, ending with a potent romantic sentiment that ends on a haunting note. But I predict more people are going to remember tracks like 'Unlimited Rhyme' for its pileup of bars, or the anti-snitch track of 'On The Low' and 'Death', or 'Double Jointed', which is far better than any weed song has any right to be. On the flip side, I'm not wild about the central conceit behind 'Heroin' in comparing his rhyming to drugs, and thankfully guest star Awkward J mostly avoids the concept and arguably holds his own a bit better against that production. And the big reason why that is comes in the rapping itself, and I will give Brazy Da Bo$$ a lot of points here. For one, his skills have markedly improved: he's on beat, he doesn't nearly force rhymes as often, he rarely if ever rhymes words with themselves, and he shows off more distinctive flows than I think Migos have ever used in their entire career. Do I wish he brought a little more intensity and firepower to his delivery? Sure, but if he's aiming for a more laid-back, technician approach, I can get behind that. The problem comes that his choice of flows within songs can feel inconsistent, and that means otherwise really good songs can feel clunky when he shifts things up, sometimes even within verses. The rhymes are all there, but the syllable count can feel off from bar to bar, which means he can be forced to simplify his cadence and he doesn't quite have the same groove within the verse. Now there are ways to get around this - a more melodic delivery has let Drake sidestep this consistent issue for years - but Brazy da Bo$$ seems more technically focused in a Wu-Tang or Kendrick mold, and as such unless you're aiming for a big payoff with the flow switch or are ramping up the intensity vocally, I'd opt for a tighter bar construction in terms of syllable count and cadence. Now I'll be the first to admit I'm nitpicking here and getting pretty technical, but I'm doing so with a real purpose, mostly because there's a very real chance Brazy Da Bo$$ will see this and I get the impression at this point in his career he's more interested in the acclaim of older hip-hop heads who respect that level of lyrical construction - hell, he says so himself on this record, so why not get critical in that category? And here's the thing: he's so damn close to getting to that point I'm excited to see him actively get there. His production is more on point than ever, and while I think his more personal tracks have cut deeper his bars and punchlines have never felt more consistent, and he's got the good taste and maturity to avoid obvious blunders. With a little more intensity and some tighter construction, I can see Brazy Da Bo$$ having a real following, not just in Baltimore where I'd easily say he's competitive with other native rappers like King Los and Blaqstarr, but beyond that. Again, I'm not crazy about this project, but it's one on the right path, so I'm giving it a light 7/10 and a recommendation, especially if you're into artists who know great production and are delivering content that might not challenge but is solid all the same. Folks, I've been covering this guy since 2015 and he's a stand-up dude who is only getting better - I suggest you get on the bandwagon now, and check this out.